Muammar Gaddafi has been married twice. His first wifeÂ Fathia Khaled was a schoolteacher. It seems to have been a traditional Libyan marriage, arranged by their families, as it’s reported that they never met until the wedding. The marriage didn’t last long. They separated after six months, but not before Fathia was pregnant withÂ Muhammad al-Gaddafi, Gaddafi’s oldest son. 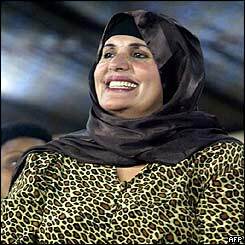 Safiya Farkas (Kash) Gaddafi is his second and present wife and the mother of six sons and one daughter – all by Gaddafi. They also have one adopted son and one adopted daughter who was killed in the American bombstrike on the family compound. Just for fun, I’ll stir the pot of speculation and report that some claim she is not Libyan at all, but a Bosnian Croat nurse from Mostar! That story says that Gaddafi met Zsofia (her name then) in Tito’s Yugoslavia.Â ApparentlyÂ Farkas is not an uncommon name in Croatia and Hungary, and means “wolf” in Magyar (Hungarian). It seems that Bosnia state media ran a story on Safia Farkas Gadhafi on Dec 11 2010. I don’t read South Slavic, so can’t verify. SheÂ traveledÂ often to Europe with her entourage of two dozen bodyguards, several women and loads of children. When she traveled in Libya, it was by chartered jet; Â a motorcade of Mercedes vehicles waited to pick her up at the airport and whisk her away to her destination. Those days seem over now! children are all tall and good-looking, so we’ll take Barbara’s word on that. SafiyaÂ told Walters, “If my husband was really such a villain, do you think I would have stayed with im until now?” Â Duh? The bulging shopping bags tell the whole story. And where do they get their money for the little shopping forays? â€œAll of the Kaddafi children and favorites are supposed to have income streams from the National Oil Company and oil service subsidiaries,â€ one Wikileaks cable from 2006 says. i miss Gadafi so much we are morning him here for the next six month and each month will set flowers for him we love you your soul can not be turched now even if they harm the body that is just soil now. Search after Safya Farkash on google..she is of partial hungarian origin(the name farkas is common in Hungary,menas wolf,ad dib in arab..),and aortial from the al Barassi tribe. Not that bad at all? Have you been watching the news the last 6 months. How can you defend a man who would do that to his people? If Gadafi was so bad, how come that Libyans had good housing, GDP, sponsored education aboroad if one succeeds to have good marks? How come they had provided buses to take them to work and back, or company’s cars if they were supervisors. It is easy to poo-poo the man when he is down. I had a member who worked in Libya and he claims that it was not that bad at all. I cannot wait to see how “good” it will be in the new demokracy run by clans who hate each other and quite likely will fight amongst. There would never be an uprise in Libya if West was not interested in their oil fields. That part about Aisha’s husband is pretty interesting. Did you check out the video of her wedding on my site? In sum, there should not be so much misinformation and mystery about Col. Gaddafi and his family; they have been running Libya for over forty years! Where’s the intelligence? Of course it’s known â€” ‘they’ just don’t want the skinny on Gaddafi and clan out there in the public domain. Go figure. 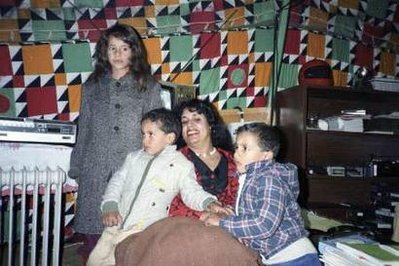 Anyone can see that Gaddafi’s children by his second wife, Safiya, don’t look like other Libyans; they are taller, fairer, and have more European features. Gadafis wife is from Mostar, Yugoslavia. Thanks for your great input on this intriguing story. Fiction could not be better! After she gave birth he divorced her. Her father hated him for screwing his daughter’s life and her brother Khairi went and snitched to Gaddafi. The father was jailed for a few years and his son Khairi became one of Gaddafi’s confidantes and is still with him now. Safiya Farkash – Yes she’s Libyan, from the Al-Barrasa (plural) tribe located in Al-Baida, in the east of Libya. She grew up in Benghazi and I know because I used to play on the street where her parents apartment was. She also has a famous brother Salah Farkash. He was a Gaddafi loyalist but died in the 90’s from alcohol abuse. Also she has a sister who is married to Abdalla Senoussi, Gaddafi’s righthand man and fellow criminal also wanted by the ICC. I noticed since the Feb 17 revolution in Libya began that people from the Former Yugoslavia and particularly Serbs, idolize gaddafi and claim that he can do no wrong. Now they’re are also claiming that his wife is Balkan! Please, please…take them both and their MONSTEROUS CHILDREN. She went to school with my aunts. She was not a normal person; always laughing for no reason and loudly for no apparent cause. Safiya is a Bosnian from Mostar. Period. Does it seem strange to have a suspicion that Saif Ghadai is closeted? Between his close relationship with Austrian Jurgen Heider, the absence of any prominent romantic partner and frankly, forgive me for the stereotype, but his style? He just seems like a gay guy from London. . . (I won’t stretch this by pointing out that he has a very Siegfried and Roy-esque obsession with white tigers). I read in your article about Moamer Ghaddafi and His Family that his adopted daughter HANA GHADAFI died during the American bombing of Ghadafi’s home in 1986. This information has been propagated by the Ghaddafi’s regime BUT it is not true at all. The daughter was not involved at all, The same girl has survived and qualified from the medical school in Tripoli. She visited London on many occasions for shopping and for medical treatment. During her medical school years, she used to get a special room in each hospital she goes to and on occasions she does not give the keys back after she leaves and the room stays locked for many months despite the hospitals’ needs for spaces. Since her qualification she stayed in the Department of Surgery, at the old Tripoli Central Hospital. Her abuse of power has been way beyond any imagination. She used to order people and change senior doctors and even sack them and bring new ones. The facts can be verified by a huge number of doctors working in the central hospital of Tripoli. Living in fear everybody just obey her orders and even worse some senior managers and doctors were heared quoting her as “The DOCTORA said…..”. By the way Doctora is the female version of doctor when used in Arabic. There is a serious concern that she may be used to transfer the Gadafi’s family’s stolen wealth unless the world unless this has not happened already. I thought I read somewhere that Safiya had only been abroad once. I think you are mixing up the First Family of Libya with the Saudi Arabian royal family. The looks of this woman are a 100% Tribal Arabic, defenitely Libyan! No Votim, all the world become from Albanians. According to media on Balkans, Safiya Gaddafi (born Sofia Farkas (FarkaÅ¡)) is born i Mostar, todays Bosnia Herzegovina, former Yugoslavia. Her grandfather, Ivan Farkas, was a supervisor of the school administration at the time of the Austro-Hungarian Empire. There are also interviews from the 70-ties in the yugoslavnewspaper with Safija. She met Gadaffy then he was studied at the Air Force Academy of the Yugoslav People’s Army in Mostar. Gadaffis’s wife is albanian from Tetova (Republic of Macedonia). thank you for the information about her tribe. I will amend my article. i would like to clear some thing you have said about Mrs Gadaffi’s wife. she is a Libyan originaly from east of Libya city of Albeida she is from a well known clan called “ALBARASSI” the Clan is one of the largest in the eastern part of Libya . as for Mr Gadaffi we Libyan do not know much about him untill 1969, he claims that he belongs to ALGADAFI clan.